As Valentine’s Day gifts go, famous jewelry lover Elizabeth Taylor received one of the most incredible in 1969—from her husband at the time, Richard Burton. Burton gifted her with the 16th-century La Peregrina, one of the largest and most symmetrically perfect pear-shape pearls in the world, which he purchased for $37,000 at auction, beating out a member of the Spanish Royal family. La Peregrina was once part of the crown jewels of Spain and eventually passed into the hands of Joseph Bonaparte, king of Spain and Napoleon’s brother; the king’s nephew, Napoleon III; and James Hamilton, the Duke of Abercorn. La Peregrina means “the Pilgrim” or “the Wanderer.” The massive gem was found by an African slave on the coast of the isle of Santa Margarita in the Gulf of Panama in the mid-16th century. It has a history of getting lost and coming loose from mountings. 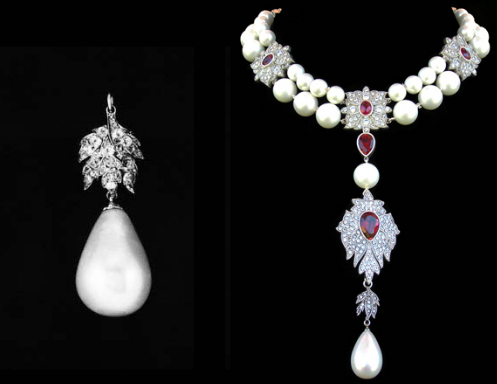 Years later, Taylor had Cartier set the pearl into a ruby and diamond necklace, with the luminescent pearl suspended; it was a design reportedly inspired by the Diego Velázquez portraits of Spain’s Queen Margarita and Queen Isabel wearing the pearl as a necklace. The pearl, still set in the necklace, was auctioned by Christie’s in 2011 for a cool $11 million.